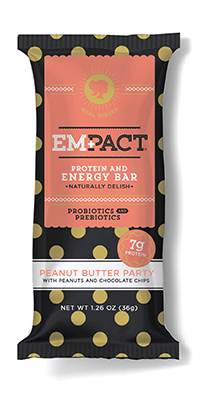 Empowering women to achieve their goals one nourishing and delicious Em+pact Bar at a time. These compact, purse sized protein and energy bars can be eaten one as a snack and two as a meal replacement. No gluten, GMO’s, artificials or fluff. They are probiotic and prebiotic. They contain 10 grams of protein and 5-6 grams of sugar. At Em+Pact we’re all about empowering the ladies so we work with non-profits to empower women daily.